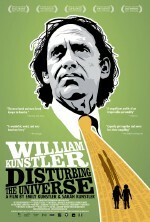 Many thematic bridges are built in the course of the new documentary “William Kunstler: Disturbing The Universe.” The main bridge connects the gap between the father filmmakers Emily and Sarah Kunstler grew up with and the man eventually known as the most hated lawyer in America. But the film’s other emotional and intellectual spans between the past and present also matter. The Sixties’ struggles are re-fought in the Oughties. An armchair observer can transition to active revolutionary. The chasm between American political idealism and American political realities must not remain unbridged. Ironically, the Kunstler daughters’ perceptual divide arose out of their loving attempt to develop a “single unified theory” of their famed father’s life. The tenets of that theory held that their father represented only innocent clients and fought only for justice and freedom in the courtroom. That description certainly accounted for Kunstler’s Sixties’ representation of clergymen who protested the Vietnam War and American Indian activists who wanted to hold the American government accountable for its history of broken promises. But the theory’s truthfulness collapsed when the daughters considered their father’s Eighties’ representation of the decidedly non-progressive property owner Leona Helmsley and accused Islamic fundamentalist killer El Sayiid Nosair. At the time, the two teenagers felt their father traded radical heroism for the dubious benefits of continued public notoriety. With the blessings of time and emotional distance, Emily and Sarah Kunstler use this documentary to reassess their late father’s life and career. The daughters’ disagreements with their father’s actions does not mean “William Kunstler: Disturbing The Universe” is a political version of a Christopher Ciccone biography of Madonna. The inclusion of home movie clips and a semi-critical film narration reaffirms the two sisters’ love for their father as a person. But in their examination of the more controversial aspects of their father’s career, the two women seek to understand how this man they loved could willingly advocate for some personally objectionable clients. The filmmakers’ path to understanding involves chronologically tracing their father’s life. That sensible if familiar decision starts off by considering Kunstler’s apparently conformist pre-1960s life. The man’s lifepath of marriage, military service, and working to pay the bills didn’t distinguish Kunstler from his fellow Americans. Yet even during that early period, some stirrings of a progressive sensibility existed. Despite receiving a bayonet wound in the Pacific War, the future radical became an opponent of war instead of an embittered racist supporter. His representation of Paul and Orial Redd in a housing discrimination case impressed on him that racial discrimination was not strictly a phenomenon of the South. What sparked those stirrings into something more was a confrontation during a trip to Jackson, Mississippi. Kunstler had gone at the ACLU’s behest to provide legal support for the Freedom Riders. While there, he was confronted by a civil rights activist and asked to step up and be more than just a mere observer. Was that eventual decision to step up what the famed lawyer called the moment of daring when you do something to jeopardize yourself? As one watches film footage of the Sixties’ various protests, one senses that Kunstler’s attitude made his gravitation towards the Yippies and the American Indian Movement a natural progression. Seeing anonymous cops beat up protestors also demonstrated the truth of law as justice’s opponent. In that context, Kunstler was probably not intimidated by drawing from the odious Judge Julius Hoffman the longest contempt of court charge ever imposed on an American lawyer. That 40 month sentence was probably a badge of honor to him. Skeptics who question the effectiveness of Kunstler’s courtroom flamboyance have not encountered Jean Fritz. This Republican small businesswoman was one of the Chicago Conspiracy Trial jurors who held out for acquitting Abbie Hoffman, Tom Hayden, and their compatriots. Kunstler’s work led her to feel sickened by Judge Hoffman’s very un-American public gagging of Bobby Seale. Yet Kunstler’s idealistic dedication to justice over law sometimes had damaging consequences. His overoptimistic belief in the righteousness of the Attica prisoners’ cause prevented him from offering a necessary reality check regarding the trigger-happy cops surrounding the prison. Attica prisoners’ attorney Elizabeth Fink felt the subsequent bloody Attica shootout could have been prevented had Kunstler spoken up. Filmmakers Emily and Sarah Kunstler eventually come to an acceptance of their father’s legacy. But their journey to that acceptance inspires the viewer to continue the Sixties’ struggles against those who would deny equality to the undocumented or the LGBT community and to fight those calling for the return of Mc Carthyism. Kunstler’s favorite sculpture showed David caught in the moment before he jeopardized himself trying to slay Goliath. That anecdote, one of many from this valuable documentary, hopefully inspires viewers to be new Davids.